Posted by Jace Stolfo on Thursday, January 5th, 2012 at 10:59am. The end of 2011 brought some good news to the Boise real estate market. The second half of 2011 showed a marked increase in the sale of real estate in Boise when compared to the same time period of 2010. In fact, the sale of new homes in Boise increased by 50% from July through December compared to 2010. In addition, existing homes sales increased by almost 16% over the same time period. 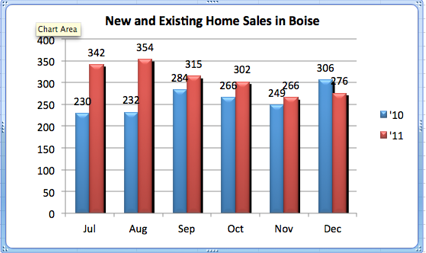 The graph below charts the monthly home sales for Boise for the last 6 months of 2011 & 2010. The Boise real estate market also saw a decrease in the number of Boise foreclosures for the last half of 2011 compared with 2010. 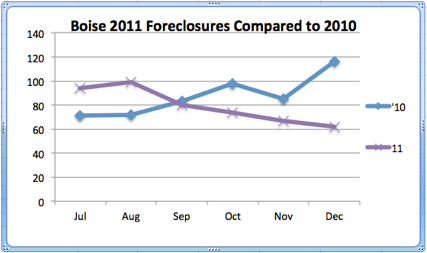 The chart below shows a steady decrease in the number of foreclosures beginning in August 2011 and continuing through the end of the year. The majority of the Boise Idaho real estate activity continues to be the sale of existing homes. The sale of existing homes accounted for almost 90% of all sales in the last half of 2011.